Gone are the days when hanging balances had to be used for weighing small items such as vegetables, groceries and so on. It was very troublesome to load the two sides of the balance with weights and goodies and look then look keenly at the needle for achieving perfect balance. 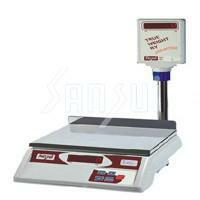 Weighing with a balance is slightly more difficult and accuracy also is compromised at times. Introduction of table-top scales made weighing a smooth and quick experience as one has to just place the items to be weighed on the platter or bowl provided on top of the scale and the weight is immediately displayed on LED screen thus making it clear and convenient for the seller as well as the buyer. Table Top scales are the best solution for such requirements of weighing on the counter-top. These scales have a robust anti static housing, high internal resolution, protected internal calibration, red colour 12.5mm LED display and also a built-in pole display at times. The stainless-steel platter provided on the top, makes it very easy to place objects safely and properly. These table top scales have a built-in battery back-up. Overload protection is provided too. Key size is large and hence operation on the key-board becomes easy. There are various models available in table-top scales. These scales can be easily placed on the counter. They have proper stability and so weighing becomes easier. Internal calibration assures accuracy. Body of such scales is either powder-coated or stainless steel and so has long durability. Besides it is easy to move these scales. They are light-weight and handy for use.